Ultrasound (also known as sonogram) is a non-invasive imaging technique that uses high frequency sound waves to look at organs and structures within the body. With no radiation exposure, it is a safe effective way to view internal organs and to assess blood flow. Parts of the body that can be examined using ultrasound are breast, thyroid, abdomen, bladder, uterus, ovaries, prostate, scrotum, arteries and veins. Ultrasound is used to evaluate a variety of conditions such as gallbladder disease, genital and prostate abnormalities, blood flow and breast abnormalities. During the procedure the patient is positioned on the examination table and a warm gel is applied to the area being examined. In most exams a transducer is then pressed against the skin and swept back and forth to obtain the image. Some exams such as a transvaginal study involve placing the transducer inside the body. 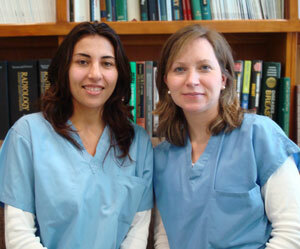 Ultrasound technologists Lyubov Yanovosky, RDMS and Kathleen Daly, RDMS. Preparation for an ultrasound is dependent on the exam that you are scheduled for. For instance, there is no preparation for a breast ultrasound or thyroid but if you are scheduling a transvaginal and or pelvic ultrasound we schedule them 7 -10 days from day one of your menstrual cycle. We will inform you if any preparation is necessary for your particular exam. The patient must drink five 8-ounce glasses of water starting two hours before and finishing one hour before the scheduled appointment with no voiding. Have regular lunch the day before exam. After lunch, take 125mg of Mylanta gas tablets. Have a low fat supper the evening before followed by 125mg of Mylanta gas tablets. You may drink water until bedtime. At bedtime take 125mg of Mylanta gas tablets. After bedtime do not eat or drink anything. In the morning of your exam take 125mg of Mylanta gas tablets with small amount of water. Do not have any breakfast or liquids.